We couldn't be much more excited for the Sony PlayStation 5. Indeed, since PS5 lead system architect Mark Cerny broke cover and spilled the beans officially on the next-gen console, revealing specs, features and capabilities, our appetite has been well and truly whetted for Sony's next-gen console. On top of Cerny's recent info bomb (which can be consumed below) every leak and report we've seen so far – and we've logged them all here – suggests Sony is working on something truly special in the PS5, something to ensure that its dominance in this console generation follows through into the next. Along the way that means scalping Microsoft's next Xbox, codenamed Scarlett, with a bombastic series of blows that leaves the various versions of the Xbox Two reeling, no matter what Microsoft decides to bring to the party. After what we've just officially discovered about the system (see below), that mission seems to be well and truly underway. With such an impressive list of hardware, features and games incoming, we're expecting a level of hype like we've never seen before for a console launch. It should all come to a head next year, and we've got a full and comprehensive look at what's on the way right here. Did Sony just hint at a 5G PlayStation Portable? 1.) Cerny confirmed that Sony's "next-gen console" will not launch in 2019. 2020 is the currently rumoured release date. He did not refer to the console as the PS5 or PlayStation 5, although Sony's traditional console naming system would indicate that is what it will be called. 2.) Cerny confirmed that the PS5's CPU is based on the third generation of AMD's Ryzen line of processors and features eight cores of the firm's new 7nm Zen 2 microarchitecture. 3.) The PlayStation 5's GPU has been confirmed by Cerny as a custom variant of Radeon's Navi family and will support ray tracing (a next-gen lighting technique that models the travel of light in complex game worlds). 4.) Cerny also confirmed the AMD chip in the PS5 has a custom 3D audio unit that will deliver far more immersive in-game sound. 5.) The PlayStation VR headset will be compatible with the PS5 and, although Cerny would not comment on whether a new PSVR headset was incoming, he did say that "VR is very important to us". 6.) Cerny confirmed the PlayStation 5 would come installed with an SSD out of the box, and then demoed a PS5 dev kit loading the game Spider-Man, which was shown to load eighteen times faster than on PS4. 7.) Cerny confirmed that thanks to the new SSD, the PS5 would be able to render 2D worlds much faster than PS4, too, meaning that gamers will get larger game worlds and be able to move through them faster while fidelity is maintained. 8.) Cerny confirmed that the PlayStation 5 will support 8K graphics, although in what capacity and if that will be native 8K remains to be seen. Sony is skipping E3 2019 this year. Could that be because it is hard at work preparing to launch the PS5? As the PlayStation 3 came out in 2006, and was followed by the PlayStation 4 in 2013, rumours circulated for months that the PlayStation 5 would launch around 2020. Comments made by President and CEO of Sony Interactive Entertainment America, Shawn Layden, who stated that "there will be no new hardware announcements at E3" in 2018, seemingly indicated at a sooner rather than later release date, too. However, on 22 May 2018, CEO of Sony Interactive Entertainment John Kodera confirmed to The Wall Street Journal that there would be no PS5 before 2021, putting a dampener on hopes for an imminent PlayStation 5 release. Since then, Sony seems to have shifted its thinking. With the Xbox Two aka Xbox Scarlett tipped for a 2020 launch, the PS5 launch date seems to have been adjusted to 2020, with some analysts thinking the PS5 will go head to head against the Xbox Two at E3 2020. One thing is definitely clear though thanks to Mark Cerny's comments, the PS5 will not launch in 2019. Can Sony price match the PS5 with the launch price of the PS4 Pro? Or will the maker have to charge gamers more for them to play PS5 games? When the PS5 does finally break cover, how much is it going to set you back? Is it going to be worth the investment? We don't have too much to go on except the cost of PlayStations past – the PlayStation 4 originally debuted for £349.99/$399.99 and when it was reinvented as the PS4 Slim it began selling for £259.99/$299.99 and up. The more powerful PlayStation 4 Pro, on the other hand, launched with a price of £349.99/$399.99, matching the original PS4 on that score – though you can now get all kinds of bundle offers and discounts on various flavours of the PS4 console. Would Sony hit the £349.99/$399.99 price point again with the PlayStation 5? We'd say it's more likely that the final PS5 price will be a touch higher (as we've seen with the Xbox One X), somewhere around the £449.99 mark, though Sony will of course want to keep the hardware as affordable as it can for gamers. Speaking of affordability, the PS5 might well come in multiple versions, like the PlayStation 4 currently does (and like the Xbox Two is expected to). The rumour is Microsoft is readying an all-digital, disc-less Xbox One S, and one of the PS5 models might follow suit. All PS5 concept designs released so far show a futuristic, angular console with plenty of next-gen features. Unfortunately we don't have insider access to Sony's design or engineering departments, but computing components continue to get faster, thinner, and smaller – so more than five years after the original PS4 launch we'd say the PlayStation 5 is set to be one fine-looking console, especially with Sony's previous track record. 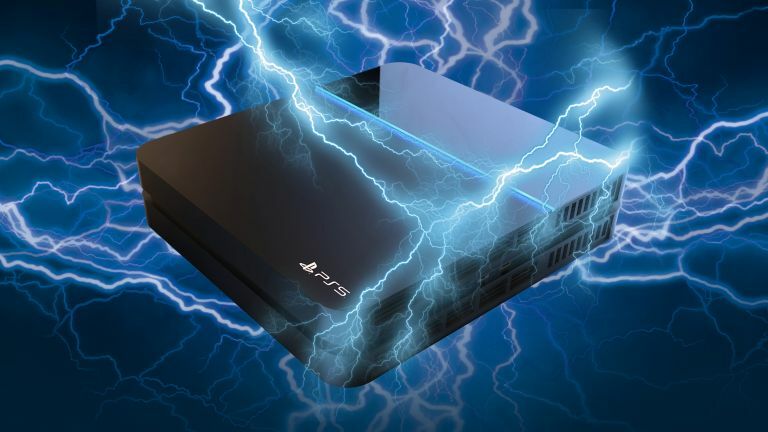 It goes without saying that overall the PS5 should be smaller and sleeker, but even with increases in broadband speeds and the rise of streaming, we don't expect the PS5 to go all-in on the cloud and shrink down to a tiny Blu-ray box set size – even with Google Stadia now on the scene. We've heard whispers that Microsoft is planning a streaming-only Xbox Two: there's a chance Sony might follow suit, but probably not for the main PS5 model. The new console is bound to have some headline 4K games, which will benefit massively from being able to save assets locally – and so a local hard drive is still a must. Add to that the need for multiple ports and plenty of room to keep the components cool, and the PlayStation 5 is still going to take up a decent amount of room under your television. Of course there will be tweaks here and there, with the DualShock controllers in line for some modifications and upgrades, but with the muscle memory of millions of gamers to consider, don't expect massive changes: an embedded touchscreen is one alteration we've seen mooted. You can see one potential leak in the image above: this is purportedly a DualShock 5 with a touchscreen attached. It comes via Twitter and there are some doubts about its authenticity, but it gives you a general idea of what a PlayStation 5 controller with a touchscreen might look like. As yet we haven't seen any genuine leaked images of the main PS5, so congratulations on Sony's console department for keeping a lid on those. What we have seen are concept renders done by other people, including the video from French designer Joseph Dumary below. We also have some rather impressive renders put together by LetsGoDigital, one of which you can see below. There's no real substance to these designs (in fact the leaks they were based on have been proved to be bogus), but they give you an idea of what might be in store. We've got a compact black box, some discreet green and blue styling, and a nice two-tone finish on the front of the box. Will the actual PlayStation 5 look anything like this? Probably not, but we're enjoying the speculation. That's not to say it won't look anything like this though: Sony is known for its love of tasteful design lines and minimal aesthetics, and there are only so many ways you can design a small black console box. A concept design for the PS5 by Dutch technology website LetsGoDigital. While hardware design is always important for a console – not least to keep all the components suitably cooled – the actual physical exterior could well be one of the things Sony leaves until last. It's probably got a number of designs on the drawing board at the moment, as getting the final look of the console in place isn't quite as important as nailing down the internal specs. When we do get a PS5 launch teaser (perhaps sometime later this year), the actual design might be hidden from view while Sony puts the finishing touches to it. Sony usually knows what it's doing in the design department, so we're confident the PS5 will be eye-catching. A sleek depiction of the PlayStation 5 by French designer Joseph Dumary. Sony's plans for the specs inside the PlayStation 5 are now, in part at least, officially revealed. The PS5's CPU is based on the third generation of AMD's Ryzen line of processors and features eight cores of the firm's new 7nm Zen 2 microarchitecture, while the PlayStation 5 GPU is a custom variant of Radeon's Navi family and will support ray tracing. This official confirmation makes sense as it was long-rumoured that next-generation AMD graphics tech was believed to be headed for the PS5, and that it had been in production for a while. Those rumoured stated the system would use 7-nanometre chips and Navi, too. Rumours also stated that Sony's principal programmers were already hard at work on adapting AMD's Ryzen technology, pointing to a major performance boost for the internal guts of the PS5. As to getting more details out of those official announcements, one of the leaks we've seen (via the tweet above) supposedly pulls back the curtain on the APU (Advanced Processing Unit) inside the PS5: it's apparently called Gonzalo, and will offer an eight-core processor, a 3.2GHz clock speed, and a 1GHz GPU clock speed. In short, a significant improvement over the PS4 and the eight-cores claim tallies with what Cerny has officially revealed. Having a separate GPU powered by AMD, as has been rumoured, would certainly help the PS5 hit those 4K/60fps high notes, as well as allow the PS5 to offer 8K support in some manner. In terms of RAM we're guessing we should expect at least double the 8GB installed in the PS4 Pro. Oh, and as to that comment from Cerny that the PS5 will boast a new 3D audio unit, this rumour indicated improvements in the audio department were incoming months ago, so again that tallies well. We've already spoken about multiple PS5 models, and we have heard some hints that a 5G-capable PlayStation Portable could be on the cards too. Sony definitely made mention of mobile devices in a recent user survey on the future of PlayStation, so it's likely that we can look forward to more than one device appearing. We can't wait to play CD Projekt's Cyberpunk 2077 game on the PS5. Top-tier games are sure to play a huge part in the launch of the PlayStation 5, whenever it happens to be, and there has been talk that PS5 development kits have been in the hands of some game studios for a while (see Sony's own Bend Studio advertising a job calling for next-gen game console experience). As we get into 2019, it now seems clear that all the Sony first-party games studios are now fully focused on the PS5, which means a launch can't be too far away now. On top of some brand new titles, it sounds like some existing games will get PlayStation 5 updates as well. Based on a slip of the tongue from a Horizon Zero Dawn voice actor, it sounds as though a sequel to that PS4 smash hit is on the way. Horizon Zero Dawn 2 could well be one of the tentpole titles that launches alongside the PlayStation 5. One other PS5 rumour suggests PS4 games will be backwards compatible with the PlayStation 5. That's based on a patent filed by Sony, and means you won't have to throw out all your PS4 discs when your shiny new console turns up. In fact, more recent rumours suggest you'll be able to play any existing PlayStation game for any of the PS consoles – that's a huge back catalogue. Let's not forget game streaming and online play either either. All the indications are that PlayStation Now will get an upgrade with the PS5, and that streaming games over-the-web is likely to at least be a part of the PlayStation 5 experience, no matter which model of the console you end up going for. Polish game publisher CD Projekt Red has already said it's working on games with an eye on the next generation of consoles, which makes us think that Cyberpunk 2077 or something like it might be one of the first titles to hit the PS5, which is why we included it in our list PS5 games we're looking forward to play. Last year's E3 gave us a host of other upcoming titles that are likely to make it to Sony's next-generation games console: The Elder Scrolls 6, the intriguing-sounding Starfield, and Beyond Good & Evil 2. Flagship games don't come much bigger than the Grand Theft Auto series, and considering GTA V came out in 2013 for the PlayStation 3 (later getting an update for the PS4), is it too much to hope that 2019 might be the year when Grand Theft Auto VI turns up? Whatever games we see, they're likely to break new ground in terms of realism and detail, thanks to the extra power of the PS5 and advances in software design. Those in the know say we're not far off having games that look as good as the best Hollywood blockbusters, and that get rendered in real time. There's good news for cross-platform compatibility too: Sony exec Shawn Layden has said that we're heading into a post-console world, where devices from Sony, Microsoft and Nintendo are more tightly integrated than ever before. A second generation version of PS VR is reportedly being worked on for release. There are plenty of other rumours swirling about the Sony PlayStation 5. We've touched on virtual reality already, and it's highly probable that Sony is working on version 2 of its PlayStation VR headset – this time though, all the necessary hardware should be built into the PS5, so you won't need an extra box between headset and console. Let's not forget, too, that Mark Cerny himself has confirmed that the original PSVR headset will be compatible with the PS5. There's talk that the PlayStation Now streaming service is in line for an update at the same time as the PlayStation 5 arrives, but as yet we're not sure everyone has the broadband capacity to stream 4K games into their living rooms. Based on comments made by a former PlayStation boss, we're going to see physical discs remain part of the console experience for the next generation of hardware. According to the CEO of Ubisoft, we're going to see one more generation of traditional consoles before everything switches to the cloud. However, considering that Sony is currently exploring and developing blockchain technology, a technology that has gaming applications, the PS5 could also usher in a new age of second hand digital game sales and trades. The idea that a gamer could lend or trade a digitally purchased game licence is really exciting to us here at T3, and could finally help the industry move on from physical media.